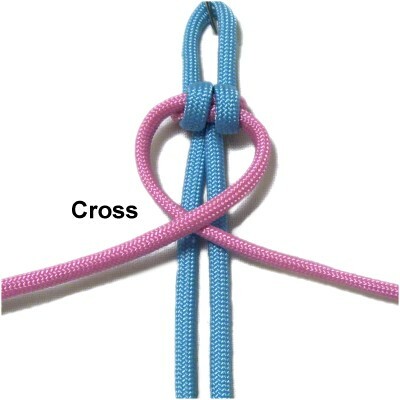 Description: Endless Falls is a simple decorative knot that's often taught in children's groups, such as Girl Scouts. It can be used to make bracelets, pet collars and leashes, belts, and similar projects. The primary color will be seen on the front and back. The second color will form a single row of loops along the sides of the sennit, which resemble stitching. As you create the sennit, you will be viewing the BACK of it. The front is seen when you turn it over (see image above). The best way to start the sennit is with a loop, so this is included in the instructions. 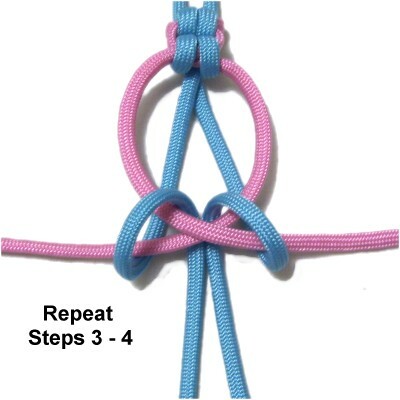 The Scout Bracelet is an easy project for kids and beginners featuring this technique. 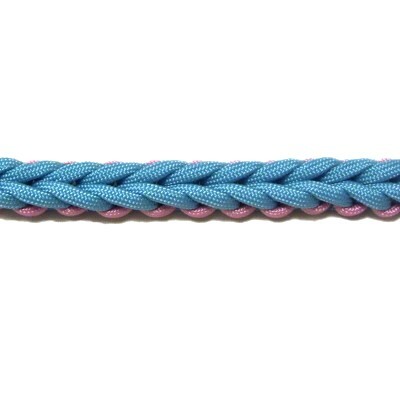 Alternating Endless Falls is one of several variations listed in the Learn Macrame section. Be sure to practice the others after you are finished with the basic technique on this page. 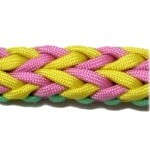 Endless calls can be found on the Fusion Knots website. Click on this image or link to visit. 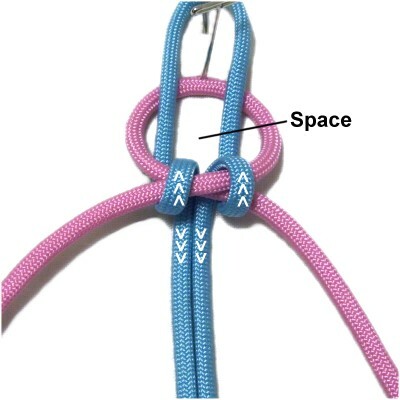 The video gallery contains tutorials for a variety of interesting combination knots. Step 1: To practice, cut two cords at least 60 inches long. When using this technique in a Macrame project, the working cord should be at least 9 x the finished length you plan to make. 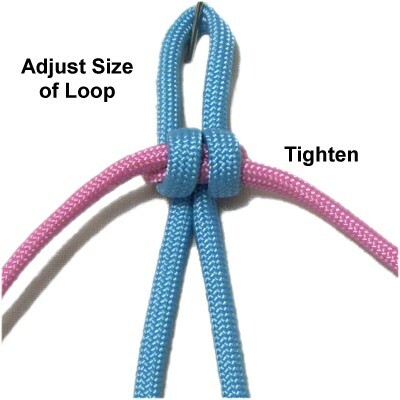 Add 10 inches if you plan to make a button knot for a clasp. The second cord should be at least 6 x the finished length. 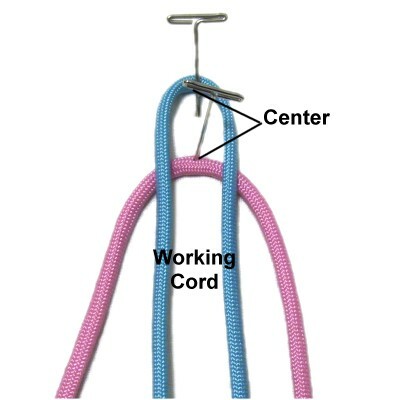 In the images shown, the working cord is blue. The holding cord is pink. Step 1: Fold the working cord at the center and secure it to your board vertically. Do the same thing with the holding cord, placing it under the working cord approximately 1-inch from the fold. Make sure the center of both cords line up. Cross the two halves of the holding cord right over left, resting on top of the working cord. Note the space between the two halves of the working cord. Step 2: Move both halves of the working cord backward, passing over the crossed area of the holding cord. Pull them through the space, then toward you, passing under the crossed area. Designer's Tip: You can see the details of this important step more clearly in the image for step 5. Pull both halves of the holding cord to tighten the loop. Then tighten both halves of the working cord as much as possible, adjusting the size of the loop if you plan to use it as a clasp. 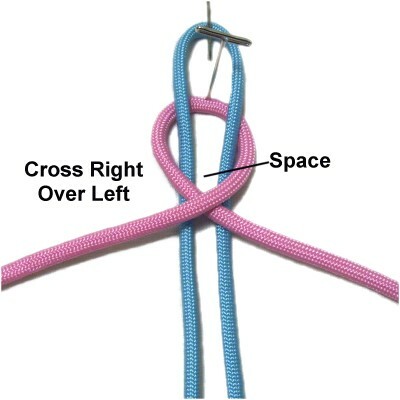 Cross the two halves of the holding cord, arranged on top of the working cord. Step 4: Separate the two halves of the working cord to create a space between them. Tighten the holding cord first, followed by the loops made with the working cord. Step 5: Repeat steps 3 and 4 several more times, until the sennit is the length you need for your project. 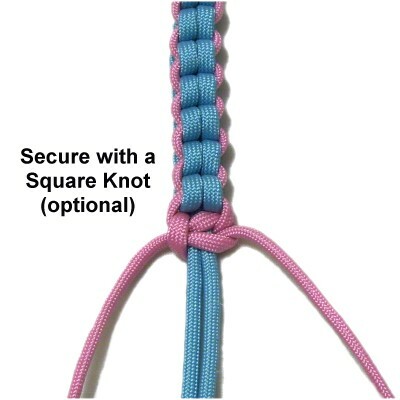 Step 6: Secure the sennit with a Square Knot tied with the holding cord. 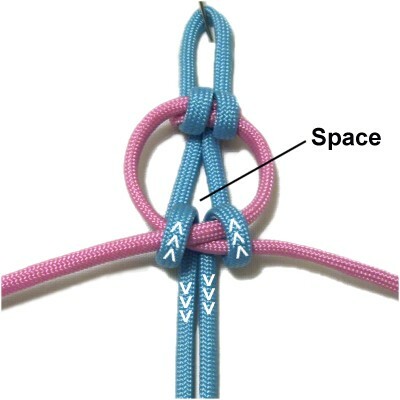 This is optional, if you prefer a different finishing knot or technique. Step 7: Turn the sennit over to see the V-shaped designs on the front. Have any comments about Endless Falls? Contact Me.